Kathryn Rated a Top UK Accountant by the Sunday Times! On 10th April, the Sunday Times published their first supplement listing the Top 200 Accountants (Your Adviser – Finding the Right Expert) in the UK based on reviews on the independent consumer ratings website VouchedFor. We are proud, but not at all surprised, to say that Kathryn Houliston was featured! To be included, Kathryn was highly recommended by 17 of her clients. All had rated her services over 4 stars out of 5, giving her an overall score of 4.5 out of 5, which is a fantastic achievement. 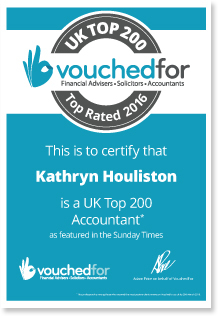 You can read all of Kathryn’s positive client reviews on her VouchedFor.co.uk profile.